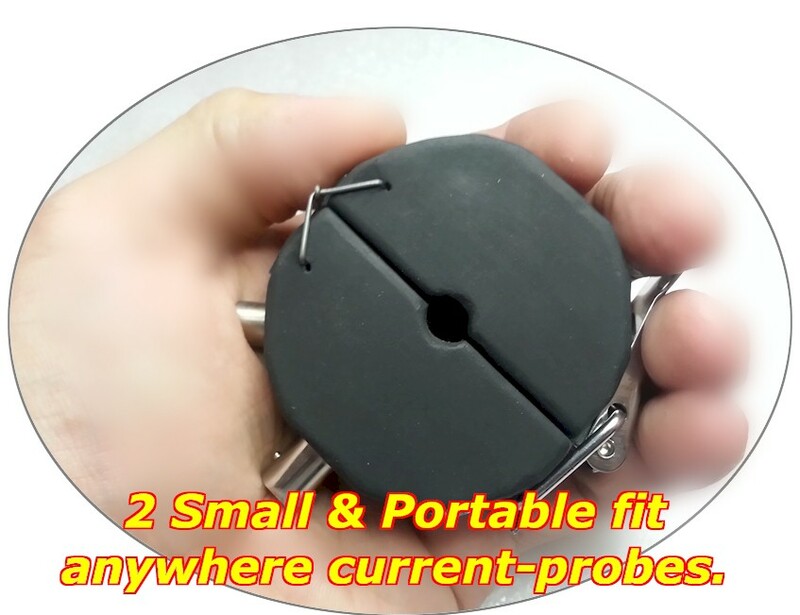 The Automotive Repair Doughnut Current Probe is a low profile, toroidal or doughnut shaped current probe meant for fuel-injectors, coil, solenoid, fan-motors and various other mid to high current devices. The "Doughnut" as it is called, can be purchased as a single unit or in bulk, which is what it was designed for. Due to its low profile, it is possible to employ up to 8 of these units, per injector or coil during diagnostics. Often times, a voltage and current analysis is needed to determine the issue. Traditionally, clamp-on current or Amp probes that read DC voltage have been edgy and hard to stabilize. 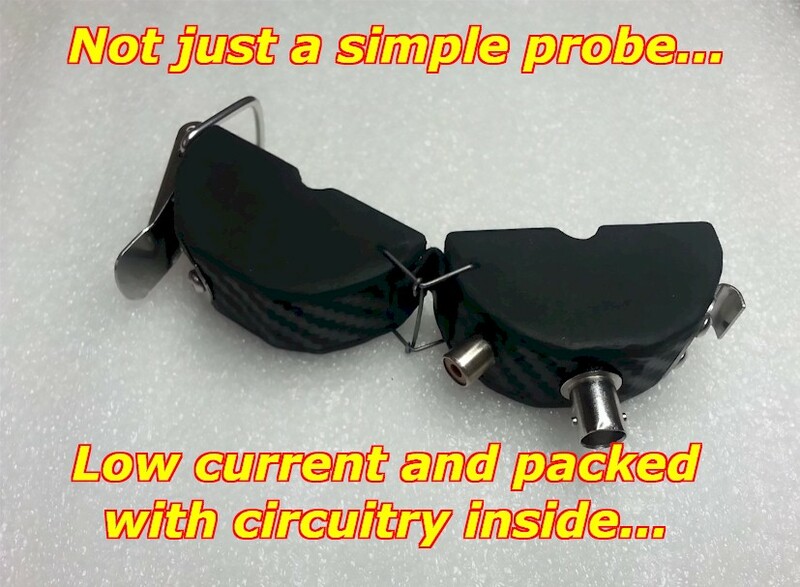 The Doughnut Clamp-On Current Probe is the answer to this problem. 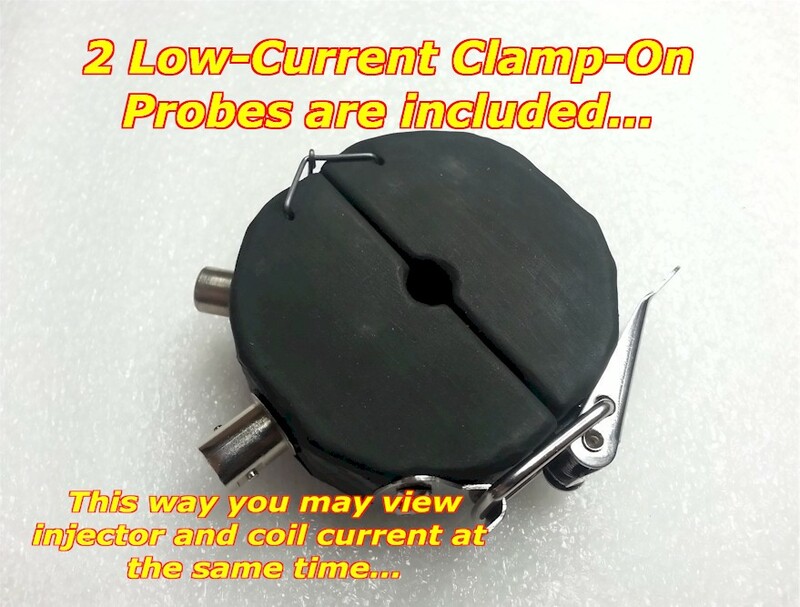 There is a huge difference between AC and DC clamp-on current probes. The AC clamp-on probes, those you find at Home-Depot or you hardware store, is a magnetic current probe. It is used by electricians to troubleshoot home or commercial electrical issues. The AC current probe has no use in automotive diagnostics. Enter the DC current probe, which was not even possible a decade ago. The reason is that DC clamp-on probes utilize special sensors and circuits to read the passing DC current. Those developed by Fluke and Tektronix are accurate, but very expensive and not cost effective for a tech or auto repair shop. That brings us here, to the Automotive Clamp-On Doughnut Current Probe. The Doughnut is a cost effective, extremely accurate, rugged, internally supplied circuit and amplified DC current probe. 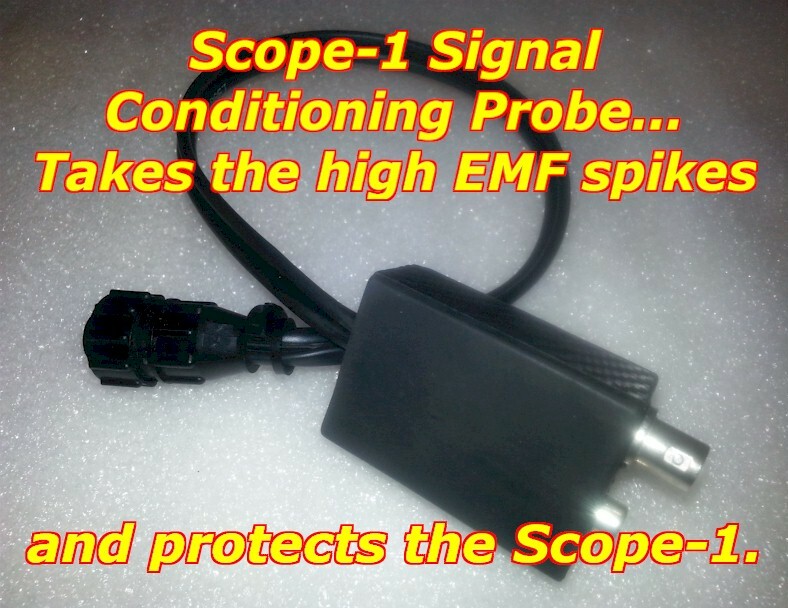 It can be used with our own Scope-1 or any other oscilloscope. Why the weird doughnut shape? Simple, convenience and auto repair applicability. This is not the only doughnut shape design, but it is the world's first automotive DC doughnut shape current probe. It is shaped that way to be able to go deeper into the engine bay wiring harness. 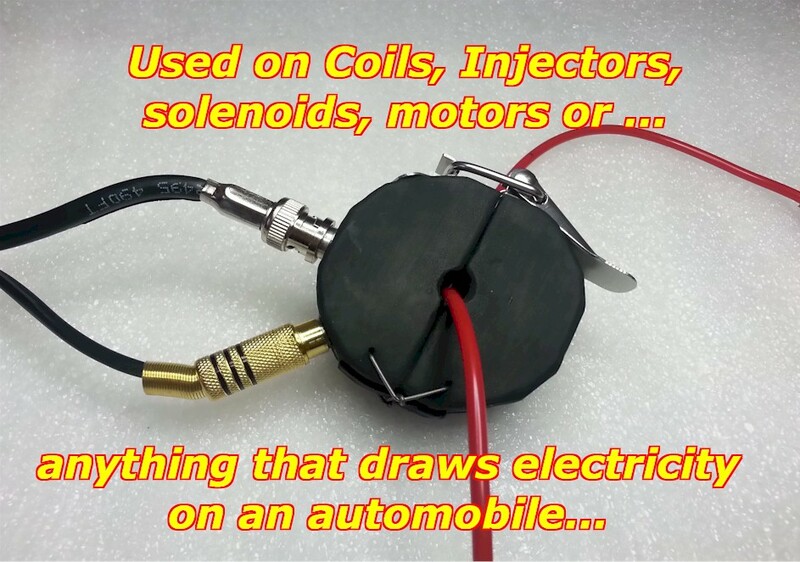 More than anything, it's made that way so that you are able to uncover a fuel-injector or ignition coil wire sheathing and connect at least two of these probes. Why at least two? 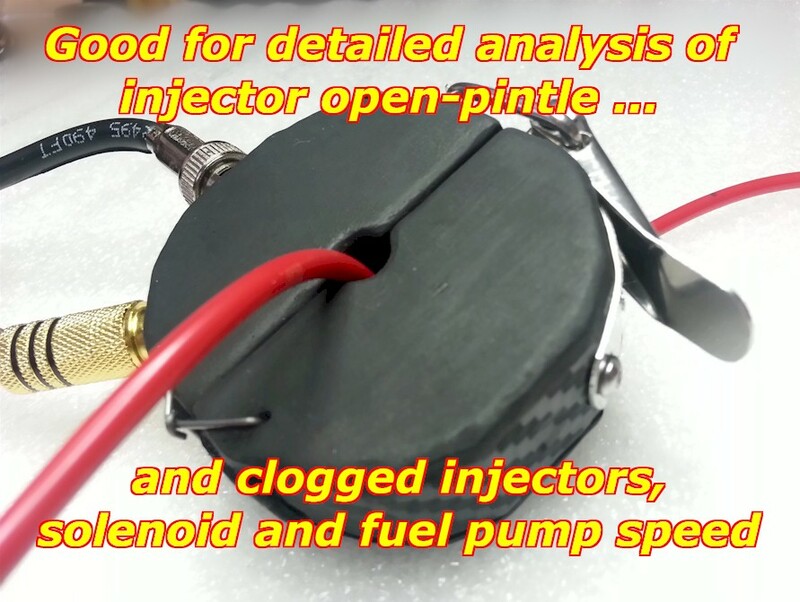 Simple, you need to compare one injector to another; and for that you need at least two probes. The idea is to have a maximum of 8 (8 cylinders) of these doughnut probes to be able to view a current and voltage signal waveform at the same time. That's what it's all about, convenience. So why would you want to be able to view the maximum amount of cylinders? Why not remove the injector or coil fuse and tap there? Yes, this is very possible and doable, but not always. The newer trend is for manufacturers to add more Oxygen sensors or AFR-Wide-Band sensors. You new see 4 cylinder engines with one O2 sensor for every two cylinders. Imagine an 8 cylinder engine. In one word, manufacturers want more control over the air-fuel mixture, down to the cylinder. That's why this technology was created. That's why the Doughnut Clamp-On Current Probe was made. You can certainly get along great with one or better yet two of these, but the capability and the cost savings is there is you want to go with a full kit. 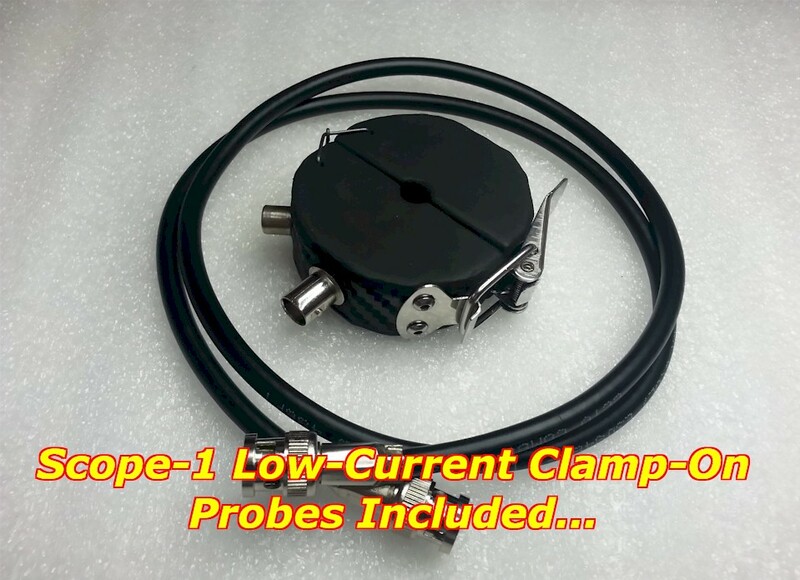 The benefits of the Automotive Doughnut Clamp-On Current Probe are these: Rugged almost indestructible, has internal current sensing DC circuitry, the signal is amplified for a low signal-to-noise ratio, can be used with any oscilloscope or graphing meter like Fluke, Vantage, Modis, Pico, etc, is totally integrated with the Scope-1 using the "Signalator" module, connects to it's own regulated 5 volt very stable power supply, rock solid signal output worthy of automotive repair use. The Doughnut current probe comes with all the needed cables, includes a BNC scope cable-connector, RCA style 5-volt power cable, signal amplifier conditioner and filter circuitry and plastic case. The signal amplifier conditioner and filter protects your oscilloscope. 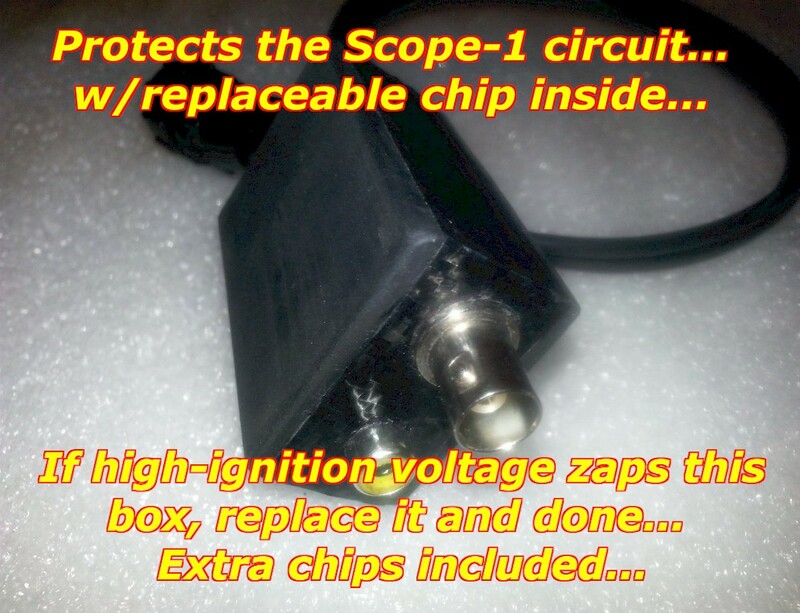 It it gets zapped by say a spark plug high-voltage, just replace the included chip and no harm done. We though of everything.